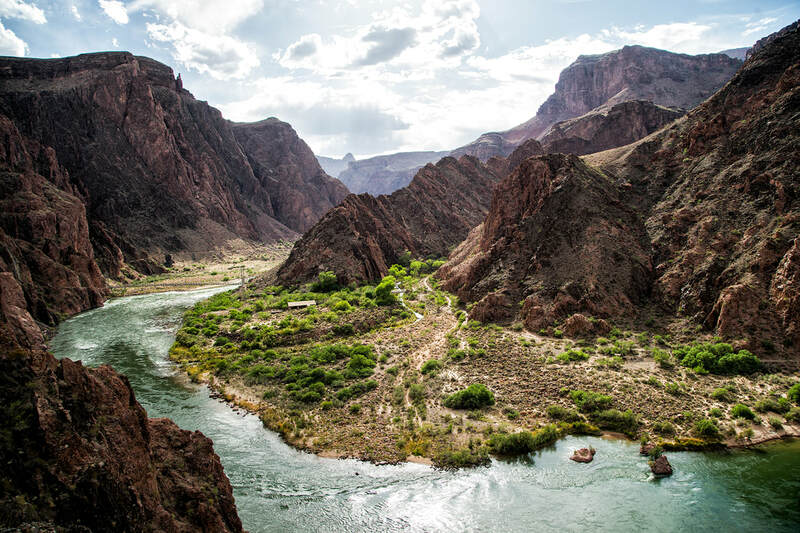 Grand Canyon was largely uncharted territory until 1860 when John Wesley Powell led an ill-fated expedition down the Colorado River through the mile-deep gorge. President Theodore Roosevelt on May 9, 1903 urged protection of Grand Canyon and suggested that every American visit the natural wonder: "Leave it as it is," Roosevelt said in a speech on the South Rim. "Man cannot improve on it; not a bit. The ages have been at work on it and man can only mar it. What you can do is to keep it for your children and your children's children and for all who come after you, as one of the great sights which every American, if he can travel at all, should see." Five years later, Roosevelt created a national monument. Congress designated it a national park in 1919. Since then, close to 200 million people have visited the park. the South Rim. Just find a good place to relax away from the crowds and enjoy the view. 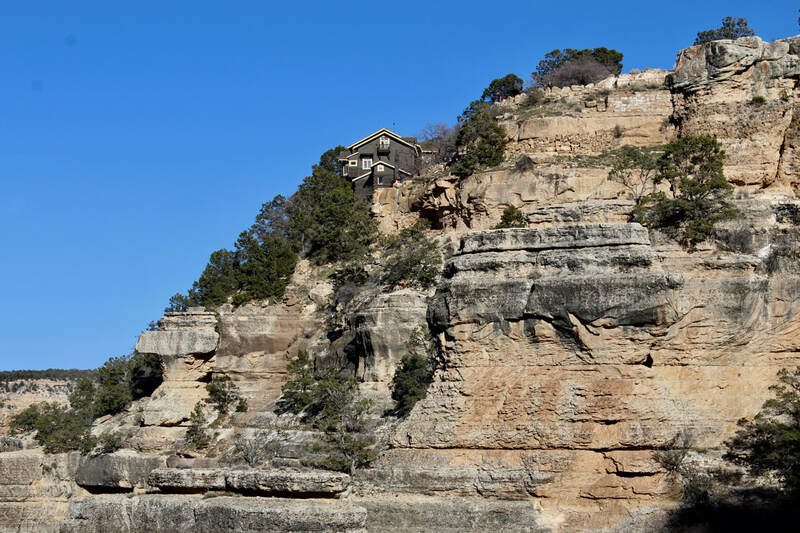 Grand Canyon is up to 6,000 feet deep and ranges from 10 to 18 miles wide. The Colorado River carving through ancient rock layers runs 277 miles through the national park. The park is 1,904 square miles or 1 1/2 times larger than Rhode Island. 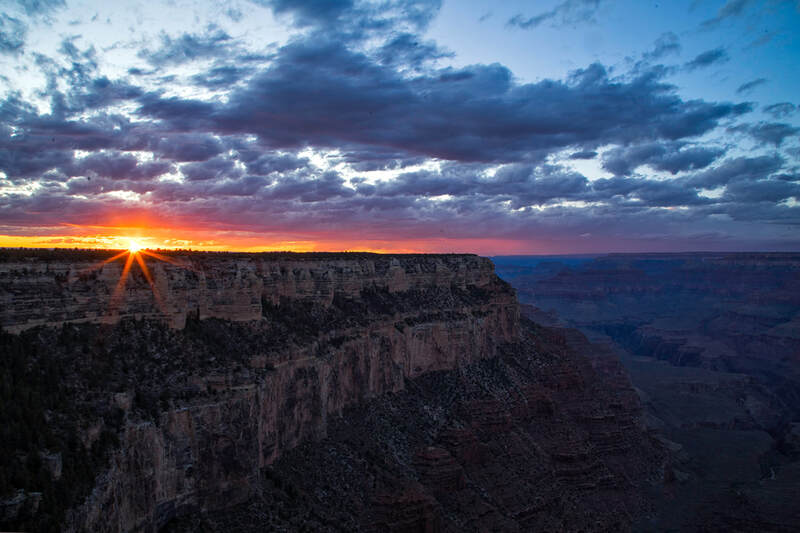 ​Be mindful that the South Rim elevation is nearly 7,000 feet and intense summer heat can quickly deplete the energy of travelers not accustomed to Arizona's arid climate. Daytime highs on the South Rim can climb into the 90s in the summer and hit over 110 degrees at the bottom of the canyon. Conversely, visitors are wise to dress in layers for warmth since winter storms aren't uncommon from October to May. 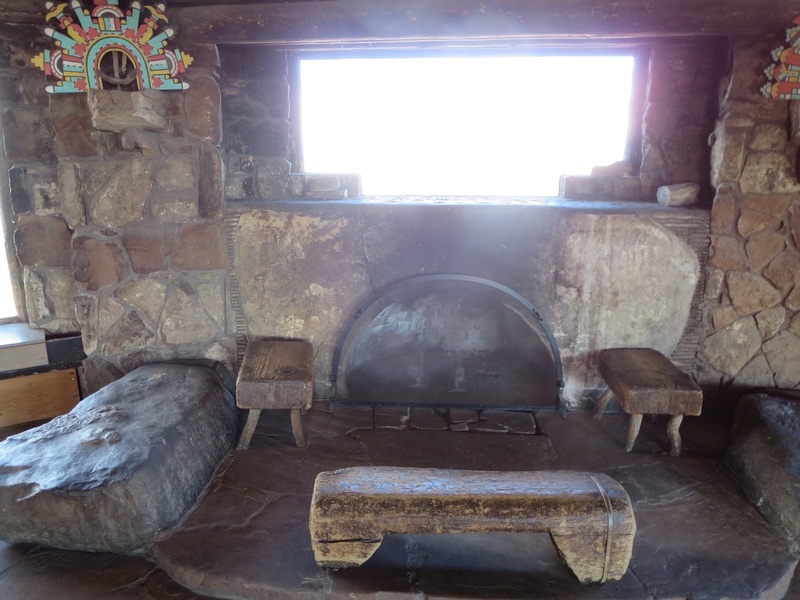 On chilly days, El Tovar and Bright Angel Lodge have warming fires in their oversized fireplaces. Don't miss the opportunity to have a hearty breakfast in El Tovar with its white-tablecloth service or splurge and have dinner there in the rustic but elegant dining room. Desert Watchtower at Desert View was completed in 1932. Sunrise in early November near Lookout Studio on the South Rim. Fred Harvey Co. architect Mary Jane Colter designed the Watchtower. Multiple levels of the tower exhibit imagery of ancient Puebloan people. 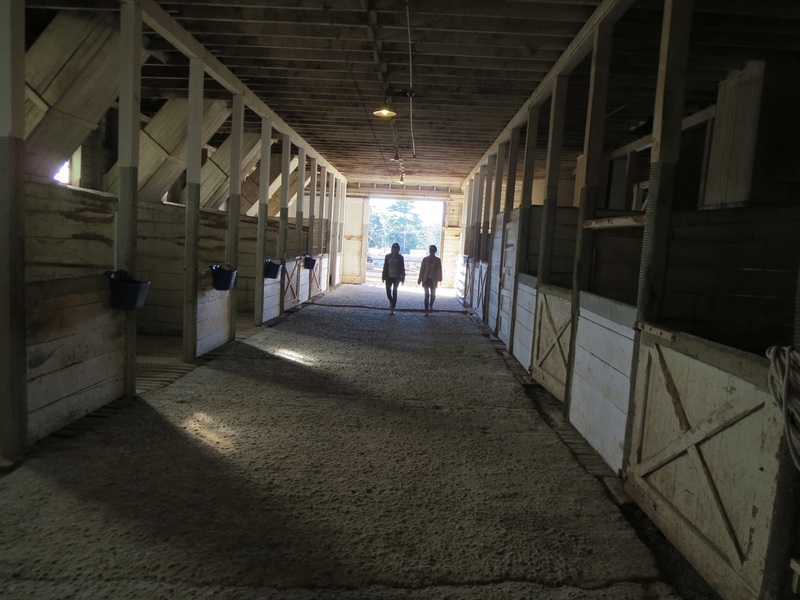 The historic mule barn in Grand Canyon village is home to the mules that traverse the canyon on the Bright Angel and South Kaibab trails. This is the most direct route from just east of Williams to Grand National Park, a distance of about 52 miles. It is a wide two-lane highway that is straight and without any steep hills. The scenery is OK through high desert terrain with distant mountain views. There is gas and other services along the way, including at Valle about half way to the park. The trip takes about an hour. This is a scenic route through Ponderosa pines and aspen trees northwest of Flagstaff with stunning views of the San Francisco Peaks and Kendrick Mountain. This 75-mile drive takes about 90 minutes. US 180 is narrower and has more curves and hills than SR 64 but it is a safe and pleasant drive in good weather. The road goes up to 8,000 feet so keep that in mind if there’s a winter storm. 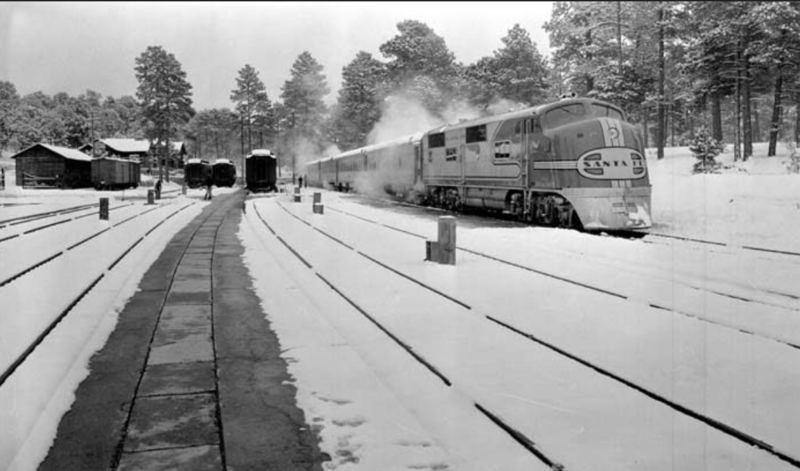 To avoid heavy traffic in downtown Flagstaff take the Butler Avenue exit off I-40 north across the railroad tracks to Route 66. Turn left and travel about a half mile to Switzer Canyon Drive. Turn right and follow Switzer Canyon up a hill where it will connect with US 180 at Humphreys Street. Travelers with a little extra time might consider taking US 89 north from Flagstaff around the eastern flank of the San Francisco Peaks up to Cameron and SR 64. This is a scenic drive that descends quickly from pine forest to the Navajo Reservation and on to the historic Cameron Trading Post. through the park entrance gate on this route and that’s important during the summer and spring break. Be sure to stop at Desert Watchtower and enjoy the many scenic vistas along SR 64 on the 25 miles of the East Rim Drive from the park entrance to Grand Canyon Village. This eastern route to the South Rim also has an optional side trip through Sunset Crater Volcano National Monument and Wupatki National Monument, an ancient Puebloan village. The loop road through the two national monuments adds about 20 miles to the trip, but it’s worth it even if you don’t care to spend a lot of time in either park. There is a $25 fee that allows entrance to both parks. ​My favorite route from Phoenix to Grand Canyon mostly avoids the interstate and takes an unpaved road through the Verde Valley. Take this 4 1/2 to 5-hour route at your own risk. It starts on Interstate 17 north to SR 69 toward Prescott Valley, then veer off to SR 89A over Mingus Mountain to the funky former mining town of Jerome. This is a good place to stop for breakfast, lunch or an hour of exploring. Then take Main Street northwest past the post office and fire station to Perkinsville Road. This leads to an unpaved road that goes uphill above Jerome before descending into the Verde Valley. The first half of the 50-mile route is unpaved but suitable for a sedan even if it’s a bit rocky in a few spots. At the outset, it follows a former narrow-gauge railroad route before descending to a bridged crossing of the Verde River. The road offers good views of Sedona's red rocks and skirts Sycamore Canyon. Be sure your car has fuel and is in good shape because you will encounter only a handful of motorists on this 90-minute drive. Travelers can dine or visit shops in Williams before driving on SR 64 for the final hour to the South Rim. On the return trip, take US 180 to Flagstaff and then go south on I-17 to Phoenix. That route from Grand Canyon to Phoenix takes close to 4 hours.